With 2012 drawing to an end, now is the time to take stock, come up with some figures and draw some conclusions. Our e-newsletter is now two years old, so we thought it would be a good idea to look back and take stock of what we have managed to do so far. Two main considerations have guided our thinking and our concern to provide you with interesting and entertaining articles - the diversity of our articles and the FCI's "geographic" aspect. The articles published this year have covered a wide range of topics, whether scientific or informing readers about events organised by our members. The Norwegian Kennel Club hosts Dogs4All for the fourth time! On November 24-25, the Norwegian Kennel Club hosted its final international show of 2012. Taking place at Lillestrom for the fourth time, the Dogs4All-fair provided an excellent exclamation point to an exciting year. The venue for the event was the Norwegian Trade Fair, which will also be the venue for the European Dogs Show 2015. A total of 6000 dogs entered Dogs4All this year, participating in the many official NKK-competitions including obedience, heelwork to music and agility. A total of 18500 people attended the show over the weekend, and a total of 10000 dogs joined the party, including those competing. A welcome addition to the programme this year was the Norwegian Heelwork to Music Championship. This championship made its debut at this event, and the English Springer Spaniel Desperados After Eight and Anette Andresen became the first ever Norwegian Champions! The Norwegian Freestyle Championship was also a part of the weekend, with the Border Collie Scott and Anniken Jensen coming up trumps. The Norwegian Junior handling Championship is a staple at Dogs4All, and always provides plenty of excitement. This year was no exception, and after a very close competition Victoria Gill was announced Norwegian Champion. Ms Gill will be representing Norway in the international junior handling competition at Crufts next year. The Norwegian Kennel Club is proud to send Victoria to Crufts, and wish her good luck! Another highlight this weekend was the announcement of the most winning dog in Norway during 2012. 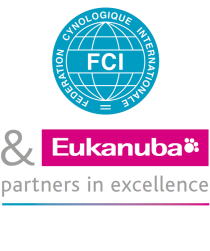 The winner, Shyloch Navigator to Edrus, owned by Helge Kvivesen, will represent Norway at the Eukanuba World Challenge later this year, and we wish them the best of luck! The grand finale of Dogs4All is, of course, the announcement of Best in Show Sunday afternoon. After much deliberation Swedish judge Dan Ericsson announced the winner – Portuguese water dog Robel Alexander the Great Aquatass, owned by Runi Kristiansen. The Norwegian Kennel Club would like to thank those who entered the competitions over the weekend, as well as the judges and the wonderful audience! We look forward to welcoming you all back to Dogs4All next year!